We know that LBG Canada companies have invested $3.5 billion in community, averaging $412 million annually since 2012. Companies invest cash, in-kind, time and program management resources towards the goal of meaningful impact. Their stakeholders - employees, customers and governments - have chosen to participate, further contributing another $1.2 billion to company community initiatives. Does community investment matter? We know that some of that $4.7 billion of investment has paid the salaries of people on the front line of impactful program delivery. We know that community investment has deepened employer-employee relationships. We know that other stakeholder relationshipshave also been improved through community investment activities. For several years, the community investment budgets of many LBG Canada companies have been under pressure. In 2014, 2015 and 2016 we witnessed teams working with less and less resource. In late 2016 we began to see more predictions for busgets to be sustained. In 2017, 50% of LBG Canada companies predicted a budget increase. Most companies cite increased profits as a key factor leading to a budget increase. And yet, increased profits are no guarantee that senior leaders will decide to invest more in community. In addition companies link their participation in LBG Canada to increased understanding of the value of community investment at a senior level. This includes awareness of increased employee and other stakeholder interest in company activities. Overall, this leads to increased senior support for achieving community investment objectives. How do companies get the attention of senior leaders? They draw upon LBG tools and knowledge to clarify the characteristics of a company-specific community investment. They measure business, community and employee impact. They report on program results with greater clarity, credibility and confidence. 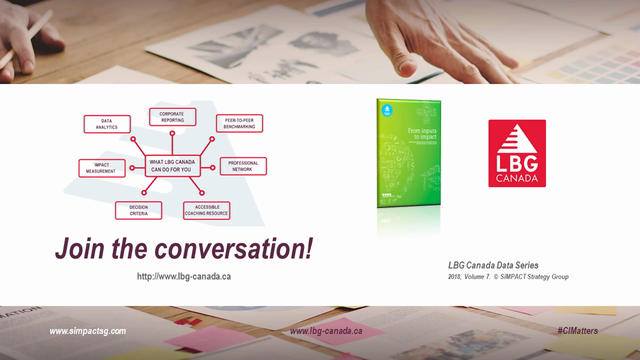 The LBG Canada program has been informing the work of community investment professionals since 2005. Community investment matters. Have you joined the conversation?